The Colour Carousel: UK Beauty Blog: TAG Post: What's In My Handbag? Hello! I wasn't tagged specifically to do this, but loads of people have done them and I just felt like doing one myself, it is one of those posts that are great for nosy people like me, hehe! I'm going to tell you what I have in my handbag. Of course, what is in there changes so often so I will just let you know the stuff that tends to stay in my bag most often. Also, I won't tell you about the other bits lying in my bag- like 143839384 receipts and sweet wrappers! Eek! Tan/Pink Large Accessorize Purse: I think this was around £16 in August. It has loads of space for cards etc and lots of extra pockets for receipt hoarders like me. Tangle Teezer Compact Styler (Pink): This was £12.29 in Boots and is a more portable version of the original tangle teezer. Basically it is a smaller version with a lid for the bristles to keep them protected when inside your bag. My Glasses: Yeah, not so interesting! Mine are some big pink framed ones from Specsavers that I use for distance. Apple iPod Touch 4, 32gb (White): I couldn't live without my iPod and it is always with me. I will talk more about the cases for it below. Nintendo 3DS: Yes I am 21 years old, and a girl! I will talk more about this below haha! My keys: A mammoth sized bunch of keys, with far more keyrings than actual keys. Pink Radley Make-up Bag: This came attached to the inside of my Radley Bag and I use it to carry whatever make-up I might need to touch up with on that day. This changes of course, but at the moment I am carrying around my 17 Miracle Matte Pressed Powder, my Revlon Colorburst Lip Butter in 'Candy Apple' and my Barry M Intense Black Eyeliner pen. My iPod case is a black and pink polka dot hard case for about £3 from Tesco. The cute pouch I keep it in is beige with hand drawn birds on it, from a little Boutique shop in Nottingham called 'Inspired Gift Shop and Studio'. The black drawstring pouch attached to it has my RHA earphones inside. I am a big kid at heart and still love playing video games. I have the blue Nintendo 3DS and carry it about with me everywhere! Please tell me I'm not the only one? :) The pink case has room for 6 games in the front pocket and the 3DS in the back pocket, I bought it from Asda for about £7. A close up of the make-up in my bag at the minute, from left to right: 17 Miracle Matte Pressed Powder, Revlon Colorburst Lip Butter in 'Candy Apple' and Barry M Intense Black Eyeliner Pen. your handbag is a gorgeous colour! and i love your iphone case.. i just need myself an iphone! damn, when i saw the handbag, no offense, but i couldnt care less what's inside it! it's such a pretty bag! that bag is absolutely gorgeous!! 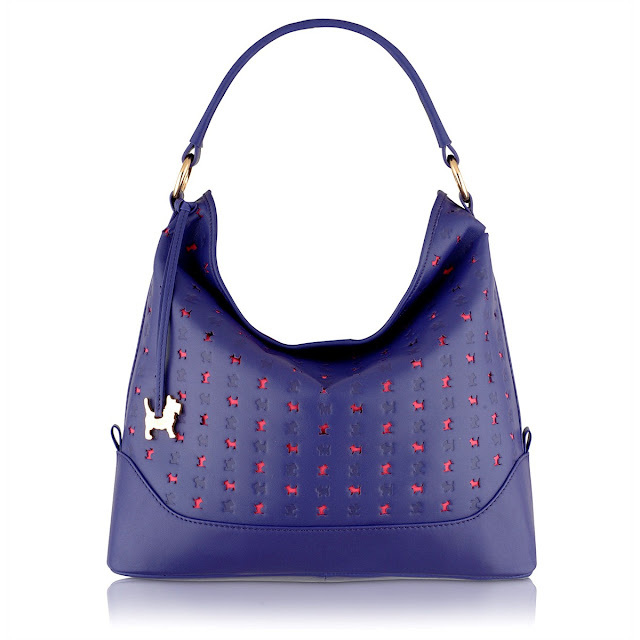 I've never really liked Radley bags but I love this one!